Great Value: Dinner + Walking Tour! Food in Rome, while unquestionably delicious, can be a daunting experience. With a pizza or pasta joint on virtually every corner, and among them many tourist traps, how difficult can be to find the exceptional spots. Take a walk with us through Rome’s most beautiful piazzas at twilight while searching for the best flavors in town. With an expert foodie as your tour guide, you’ll sample plenty of Italy’s delicacies— more than enough food for dinner- while you enjoy the beautiful streets of Rome at dusk, away from heat and manic traffic. This is a fun and exciting way to taste many types of Italian food in one night, and do some sightseeing along the way. 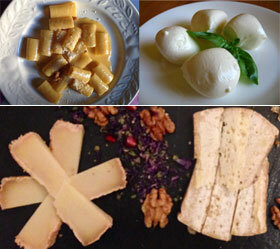 Our Rome Progressive Dining food tour is about indulging the senses, but our experience isn’t limited to food and wine. In between stops, enjoy an interactive city tour with your informative and entertaining tour guide. 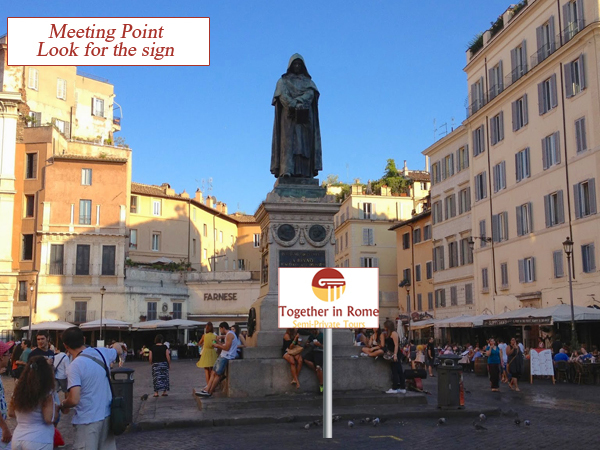 Visit Rome’s most authentic and traditional areas, as Campo de Fiori and Jewish Ghetto … just to name a few. Whether you’re an intrepid novice or a serious italian food enthusiast, you will enjoy this sophisticated but informal food adventure that takes you around Rome to celebrate its cuisine and the story behind it, feeling and eating like a true Roman. Taste true Roman style pizza. Enjoy pasta dishes sampling Carbonara or Amatriciana. Sample a wine tasting with a unique variety of local Meats and Cheeses. Finish up with an unforgettable typical Italian Gelato. Your guide won’t leave you without first pointing out the best dining, bars, gelato, and of course the way back to your hotel. *The Food consumed on the tour ranges from various types of pork to cheeses of cow, sheep and goat milk. 50 € Reduced tickets for teens 6-17 y.o. FREE For children under 6! Tour starts at 6:00 pm. Length of the tour 3 hours approximately. 50 €Reduced tickets for teens 6-17 y.o. Expert & Entertaining English-speaking guide. Transportation to and from the tour is not included. Detailed information on how to arrive to the meeting point will be provided at the time of booking. At the end of the tour, our guide will be more than happy to call a taxi for you or to point you in the right direction. We recommend you wear comfortable walking shoes and if rain is forecast, bring a umbrella as well.